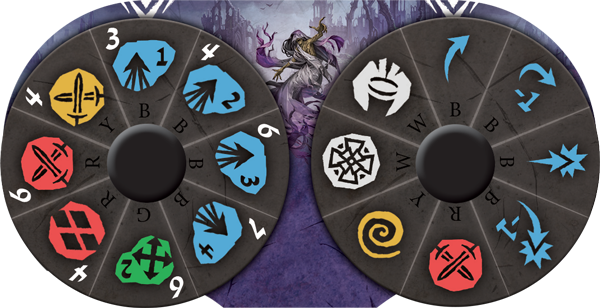 Order your own copy of the Wraiths Unit Expansion at your local retailer or online through our website today! Stories of the undead are as old as Terrinoth itself. Some scholars of Greyhaven believe that Wraiths are the manifestations of tragic or violent ends which invoked dark emotions so powerful that death itself could not still the hate. So, they say, such spirits rise after the corpse falls, now ghastly flowing forms more destructive than they ever were in life. These shades especially turn their vengeful eyes towards any who would disturb them as they haunt decaying deathbeds or other places that perhaps bore special meaning to their lives. 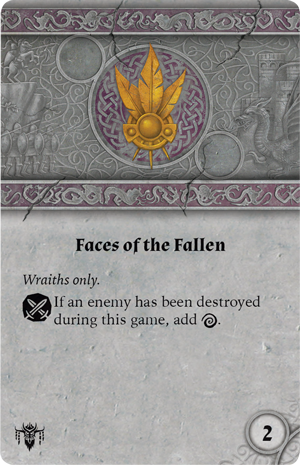 Now, the dead rise from their graves in Runewars Miniatures Game, the game of rank-and-file fantasy warfare set in the rich world of Terrinoth. As four factions battle for control of the realm, Waiqar the Undying tasks his necromancers with drawing forth the restless wraiths, otherwise deemed too dangerous for even the undead to utilize. Today, we are pleased to offer you a closer look at the bone-chilling specters of the Wraiths Unit Expansion, now available for pre-order at your local retailer or online through our website! Minor spirits are normally unable to summon the energy necessary to manifest in the physical plane. However, the magic-weilders of Mennara are able to thin the veil and summon what lies beyond to take shape in their world. Once they enter the land of the living, these horrific spectral creatures conjure fear in even the most stouthearted Daqan knights as they glide over swamps without disturbing the waters and pass through walls as if they were nonexistent, bringing with them the icy touch of the grave. For the low cost of 24 points, you can summon a deadly unit of Wraiths, three trays wide, offering a potent threat without sacrificing their supernatural maneuverability. 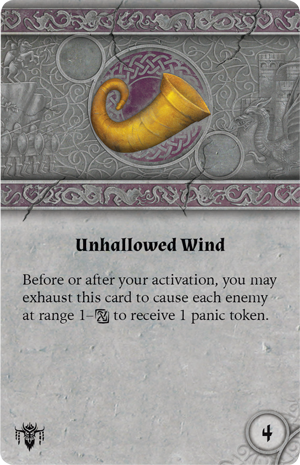 The key to the Wraiths’ power comes from their unit card ability, which enables them to move through solid objects as if they were air. During a march or a shift action, the ghosts can ignore any number of units and terrain, enabling them to stand toe-to-toe with even the swift Latari in a way that has never been seen in the Mistlands. Rather than spending time maneuvering around an obstruction, the Wraiths may move straight through, ready to flank their enemies with a reform action before they have a chance to defend. A unit who thinks themselves safe behind a crumbling wall or protected by a fortification of spikes will be frightfully surprised when your specters pass through the structure and strike on their open flank. Even beyond their unit card ability, the Wraiths feature some of the best tools for flank charges in all of Runewars Miniatures Game. With four march actions, as well as a shift and a reform, these specters are able to glide across the battlefield like mist over the marsh. This creates the unique opportunity for you to construct new strategies within your ranks as the Wraiths offer you more flexibility on the battlefield, able to turn and adjust their movements readily. When your reanimate hordes march, it may be wise to ensure that your Wraiths stand beside them to surround your living enemies and exploit their terror. 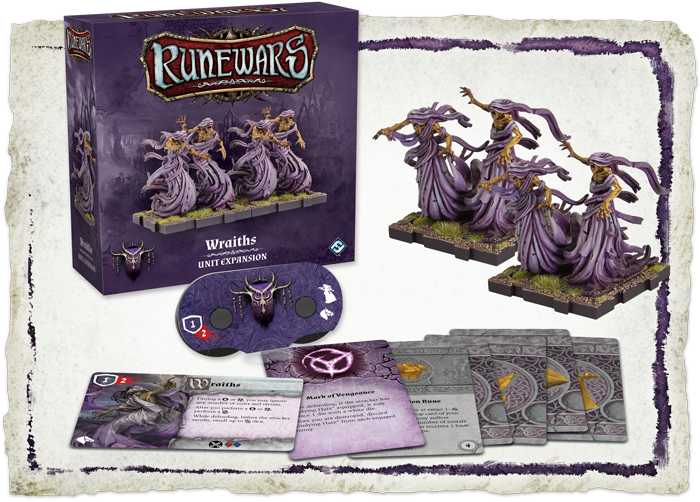 The Wraiths Unit Expansion provides you with four unpainted Wraith miniatures for your undead army, which you can customize to either bear the tattered colors of your army or to reflect the tragic tale that led your specters to their current state. One of the most famous of these stories is that of the lord of Bluestone Keep, whose madness drove him to slay his servants one by one until his loyal bodyguard was forced to plunge a sword in his back. Undeterred by the killing blow, the lord rose again as a Wraith, followed by his murdered servants, now bound to serve him for eternity in death as they wander the halls of Bluestone Keep and kill any who approach. Others in the Land of Steel spread the tale of a garrison stationed on the edge of the Mistlands that fell, not to the forces of the dead, but to betrayal from within. When confronted by the army of the undead, the frenzied soldiers slew one another in their desperation to escape. Now as punishment, they vigilantly guard their ancient charge against the living or any who do not belong in the accursed place. In addition to the beautifully sculpted figures, this expansion includes a new condition card, five new upgrade cards, and a collection of tokens to bolster the strength of your forces. 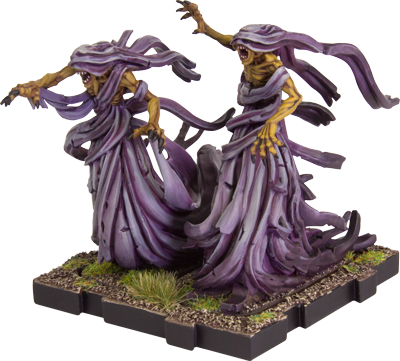 When they take to the battlefield, the Wraiths are bidden by their necromantic masters to destroy the enemy’s morale, sapping their will to live with upgrades like Unhallowed Wind that enable them to draw from the power of the stable energy runes to inflict panic on their enemies. Knowing no mercy, these cruel spirits will even force their enemies to stare into the vacant eyes of their fallen comrades with the Wraith-specific upgrade Faces of the Fallen. This upgrade allows them to add a morale icon during a melee, so long as an enemy has died during this game. Once they have annihilated your enemies’ forces, the Wraiths retreat back into the mists, lying in wait until their masters call for them once more. Summon the forces that exist beyond the veil and add them to the ranks of your undead legion. Wield the power of the Wraiths Unit Expansion and watch as your enemies freeze in fear before you! 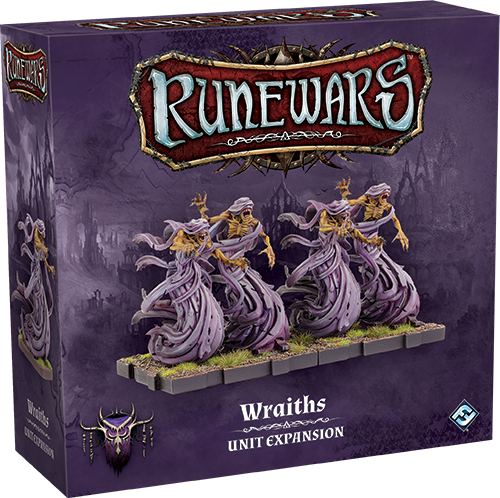 Pre-order your copy of the Wraiths Unit Expansion (RWM25) at your local retailer today or on the Fantasy Flight Games website here!